I am the youngest of three daughters, born 7 and 9 years later than my sisters. I was the baby of the family and because of the gap in our ages, I fear I was mostly an annoyance to my two older sisters rather than a good companion. But I loved them then and I love them still. Today even more so. We confer on memories, validate them, and then laugh about the absurdities of our childhood while reassuring each other that we are OK. “They” might not be but “we” have a better handle on things. I have other sisters, though. They are the women who I connected with after an introduction or shared experience. It may have been a small thread of resonance but we grabbed onto it and drew each other in, hand over hand, until we had a bond that was not a thread but a lifeline. My friend, Carol, is one such friend. She was my neighbor in New York City and she lived just four buildings down from me. She was my sister who wasn’t a sister. We talked daily. We visited each other often. Sometimes I walked down the street in the morning hours, still in my pajamas (under a coat) in order to have a cup of coffee with Carol so that we could catch up on our lives. We took care of each other’s pets… watched TV together…shared many meals…and I could tell Carol anything because she was just that kind of friend. She gave me big hugs and lots of encouragement just when I needed it and she honestly and truly accepted me, even when I wasn’t my best self. She just understood. She loved me and in so doing, helped me along the way to loving myself. Carol is just like that. She’s open and honest and accepts people for who they are with no judgement. You will not be surprised to know that there are many people who love Carol the way I love her. And that is why, a few months ago, when Carol received a diagnosis of cancer, the sisters who aren’t sisters rallied. Rides to and from the hospital were arranged, food was delivered, her house was cleaned, laundry done, and home visits were made to make sure that her needs were met. The sisters exchanged emails and updates and made sure that Carol was looked after. It’s been a bumpy road for my friend. Because I live far away there is little I can do except send encouraging words via email and texts, however, I was able to visit Carol this week as I am traveling in and around New York. 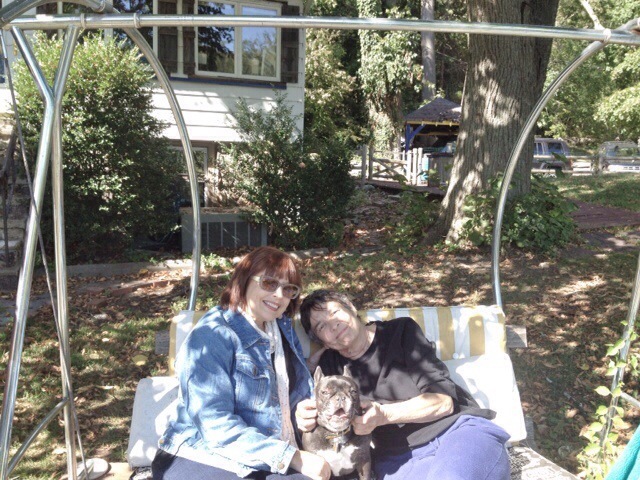 Here we are with her dog, Peanut, sitting in the swing in the sunshine. Is it inappropriate to say that I had the honor of taking her to chemotherapy yesterday? That is how it felt to me. An honor and a privilege. Thank you, Carol, for letting me sit with you. I’m sorry that I can’t do it every week but I know that other sisters are with you and will be with you every step of the way. A big, heartfelt thank you to my other sisters. You know who you are. My elderly mom and dad (They were the same age I am now) drove into Chicago to take me to chemotherapy every Thursday for twelve weeks. I was the one who felt honored. That was twenty six years ago. I sure hope you and your friend Carol can talk and laugh about this twenty six years from now. Me too Alan. You are a great example of someone who fought this battle. Beautiful post Rockyann. And it makes perfect sense to feel it an honor to be with Carol during chemotherapy. 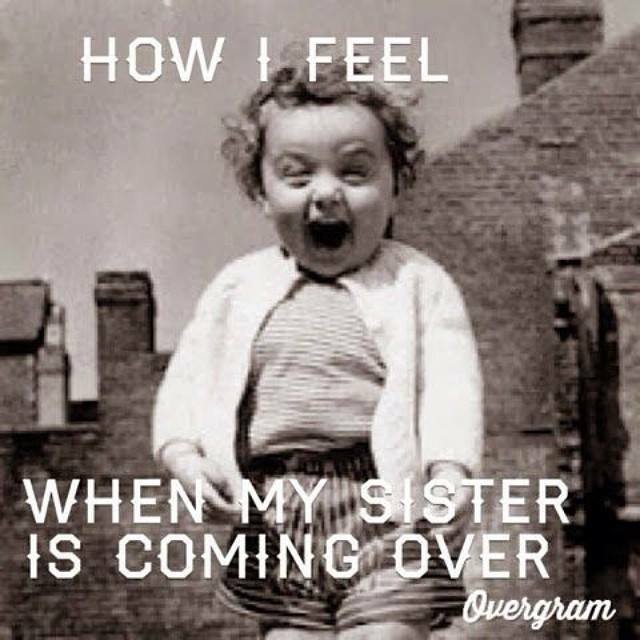 It’s what sisters do. Hugs to you both. I think we met when we shared a house in college 35(!) years ago. That’s when I realized you don’t make friends as much as find them. I’m so glad I found you. I feel the same way Debbie. Very lucky to have you. We’ve been friends for so many years. To my newest sister, thank you for sharing this. Oh. My. What more could one value from a sister than to have her sit (and laugh!) 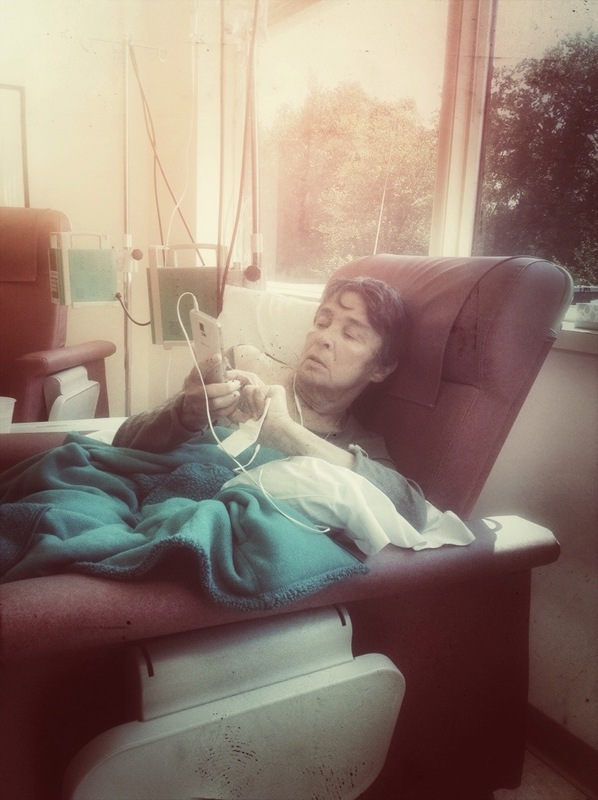 through chemo with you? You and Teresa made my first treatment memorable and much, much less frightening. I love you both so much. And thank all you people I’ve never even met for sharing your support. And, now, Alan, I think I will count you as a brother, if you don’t mind! I have seven sisters, all from the same mother and father. Now if you can hold your own in the kitchen during a party at my mom’s house when they are all talking and laughing at the same time, you’re in.